Act 10 The court will rule on the constitutionality of Act 10, a law that severely restricted collective bargaining by most public employees. Several lawsuits followed passage of the bill, but the law has been upheld every time, including in federal court. The state court is considering whether Act 10 violates workers’ rights to free assembly and equal protection under the law. Voter ID The court will consider two cases that argue the state’s voter identification law is unconstitutional. One lower court struck down the law, while another has upheld it. Tomorrow’s ruling will not affect an earlier federal ruling that found the law unconstitutional and is being appealed. Domestic Partnerships The court will rule whether or not the state’s domestic partner benefits passed in 2009 violate Wisconsin’s constitutional ban on gay marriage and civil unions passed three years earlier. When Does the University of Wisconsin Cease to be a Public University? by Michelle Felber • July 29, 2014 • Comments Off on When Does the University of Wisconsin Cease to be a Public University? Mike Brost, a University of Wisconsin-Madison senior from Shorewood, asks in Friday’s Milwaukee Journal Sentinel at what point does a state university cease to be a university? Brost writes that state spending on higher education has fallen 28 percent since 2008, and UW-Madison receives just 15 percent of its budget from the state. Nationally, as state funding drops, tuition increases — 231 percent over the past 30 years. With $1.2 billion in state funding, the UW System contributes more than $15 billion to Wisconsin’s economy. Brost argues that if current trends continue, Wisconsin’s funding of higher education will end in 2040. PROFS hosted Democratic candidates in the primary election for the 78th Assembly District on campus Monday evening. Political science professor Kathy Cramer, Interim Director of the Morgridge Center for Public Service, served as moderator. Candidates Mark Clear and Lisa Subeck, both Madison alders, responded to questions from the audience. The primary election will be held Tuesday, August 12. More information on the fall primary, including absentee and early voting, is here. PROFS will host a public forum of candidates in the Democratic primary for the 78th Assembly District on Monday, July 21 at 7pm. The forum will be held in Room 1325 in the Health Sciences Learning Center. A map of the district, which includes much of the west side of Madison, is here. Free parking for the forum is available in lots 60 or 82 (Nielsen Tennis Stadium/Waisman Center). Madison alders Mark Clear and Lisa Subeck will be on the ballot on Tuesday, August 12. Clear has served on the Madison Common Council since 2007 and is currently executive director of Accelerate Madison, an association of digital technology busineses. 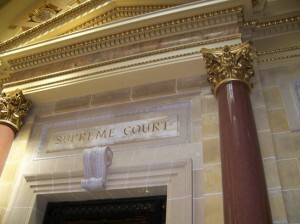 Subeck has served on the Madison Common Council since 2011 and is executive director of NARAL-Pro Choice Wisconsin, a reproductive rights advocacy organization. Isthmus also profiled each candidate this week. The full article is here. Political Science professor Kathy Cramer, Interim Director of the Morgridge Center for Public Service, will moderate the forum. Audience members will be able to contribute questions at the forum, but we encourage you to leave questions in the comments section below. The winner of the primary will almost certainly win election in November since no other partisan candidates will be on the ballot. The Wisconsin fall primary will be held on Tuesday, August 12. The date was moved from September to August three years ago to comply with the federal Military and Overseas Vote Empowerment (MOVE) Act which requires states to mail overseas ballots at least 45 days before the general election. Returning students and vacationing faculty and staff may find themselves away from the polls on election day. Voters may request an absentee ballot by mail or vote early between July 26 and August 8. Weekend voting is no longer permitted. More information on absentee voting is here. Governor: Democrats Brett Hulsey and Mary Burke will face off in the Democratic primary. The winner will challenge Republican Governor Scott Walker in November. Attorney General: Three Democrats are vying for the opportunity to face Republican Brad Schimel, Waukesha County District Attorney in November — Jefferson County District Attorney Susan Happ, Dane County District Attorney Ismael Ozanne, and State Representative Jon Richards. Secretary of State: State Representative Garey Bies of Sister Bay will face Julian Bradley of La Crosse in the Republican Primary. The winner will challenge incumbent Doug La Follette, a Democrat. Treasurer: Democrats David Leeper and David Sartori face off in the Democratic primary, while Matt Adamczyk and Randall Melchert are on the Republican ballot. Most incumbent legislators in Dane County face token or no opposition. However, first term Representative Dianne Hesselbein (D-Middleton) will face Middleton Republican Brent Renteria in the 79th Assembly District. Two Democrats are vying to represent Assembly District 78: Alders Mark Clear and Lisa Subeck. The winner will be unopposed in the November general election and will almost certainly be elected. PROFS will host a candidate forum with Clear and Subeck at 7 pm on Monday, July 21 in Room 1325 Health Sciences Learning Center, 750 Highland Avenue. 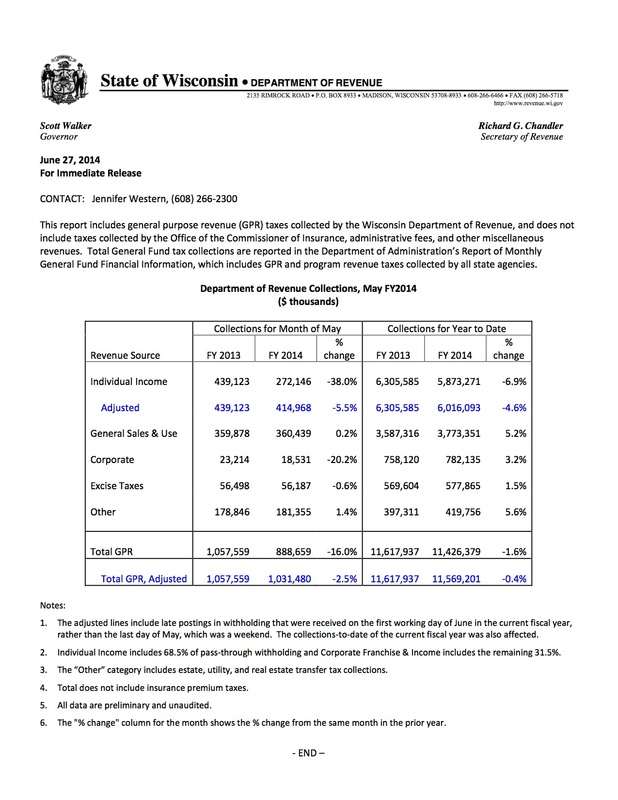 The Wisconsin Department of Revenue announced last week that nearly all state tax collections were down for the month compared to May 2013 (see chart below). Corporate tax collections fell the most (20.2 percent), while income tax collections fell by 5.5 percent. State sales tax collections were up just .2 percent. Overall tax collections were down 2.5 percent for May and .4 percent year-to-date. According to Wisconsin Public Radio, the Legislative Fiscal Bureau predicted earlier this year tax collections would increase by about 1 percent. As a result of those projections, Governor Scott Walker announced he would implement income and property tax cuts, citing a surplus of more than $900 million. Now, the state could end the year with $200 million less than predicted if collections continue to fall below projections.